I; (Ashok Parimoo), on 19th of Oct night was casually explaining to my family members that the motto of YHI is “WANDERING ONE GATHERS HONEY”. On 20th October 2013 morning, to join other members of YHI at Myathari complex, I did sling my haversack on my left shoulder and said bye to my family. Suddenly one of my family members comes running from the back and with a force shoves in my right hand, one empty plastic container that had a tight lid too. In a surprise I asked what that empty plastic container was for? I was told that since on previous night I had told them the YHI motto. So on this trek I too should collect some wild-fresh HONEY from the forest. In the evening once I reached my home, no one bothered to find out whether I was exhausted and tired? As I entered my house, every one practically pounced on me and grabbed the plastic container and opened the tight lid. To every one’s horror, from the container HONEY didn’t pour out, but only few of blood thirsty LEECHES came out crawling and jumping to grab whomever so they could catch. All of my family members screamed and howled so loud that nearly all our neighborhood came out to see what alarming horror has struck us. The scene was exactly something like a terrible incident from a very scary horror movie. As per my family members, now the motto of HYI trips should be “WANDERING ONE COLLECTS NO HONEY, BUT COLLECTS ONLY LEECHES” How is it? 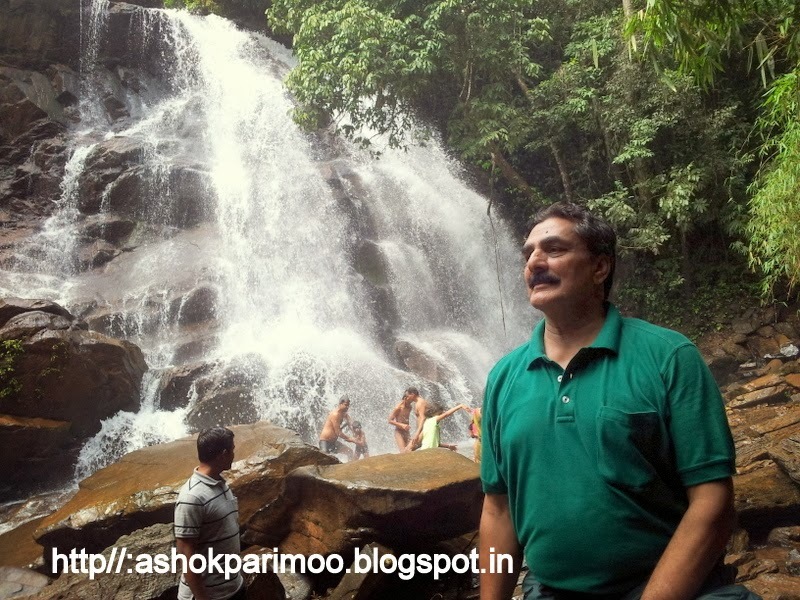 First, it was YHI member (Udupi)-Deepak, who sends me a SMS, intimating me that on 20th of October 2013, there is a planed YHI-Udupi trek near Byndoor to “ KUDUMARI WATERFALLS”. Later I confirmed about the trek with Raganna too. Since there was still more than a week left for the trek. I told Raganna that by 18th I shall confirm 100% whether I am coming or not? Since for 18th of Oct there were no prior commitments of mine, so I called Raganna and confirmed with him that I was definitely coming for the trek. As per my personal observation, Rajesk Nayak though is a very quiet and sober personality, who doesn't open his mouth unless asked for. Neither he yaps too much, nor unnecessarily contradicts any ones comments. 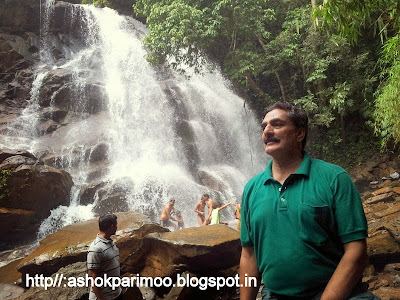 But he has a vast knowledge of almost all the waterfalls of the Western Ghats. Because, at some time or the other he has practically gone and scaled those toughest terrain waterfalls. Another YHI members who too are veteran trekkers, are Raganna and Adiga sir. So on behalf of all the YHI members, I request to these veterans trekkers, to keep organizing regular trekking programs, in future also. Thank you all. After 6:30 AM, within another 15 minutes, in a sudden flash-flood like situation, nearly 30 YHI members pour in from all the possible directions. Since, in advance only few members had confirmed of coming for the trek. So, only one traveler tempo was arranged. Then Adiga Sir & Raganna realized that we may need another additional tempo too. So, one additional Inova cab was arranged. Every one realized that if we wait for more time, few more members may pour in. Since there was no more place to accommodate in the two vans, jut to avoid the last minute confusion and misunderstanding. In a panic like situation, we were ushered into the vans and literary ran from there as if some “Phailin” cyclone was going to struck all of us too. Though, we were nearly 30 YHI members in all. Since there were many new comers, whose names, (I am sorry to say) that I don’t know. But the YHI members whom I knew and who participated for this trek are Mr. & Mrs. KSN. Adiga Sir; Rajesh Nayak; Raganna: Umanath Bhat; Subash Nayak; Suhas Kini; Ganesh; Ananth Shenoy; Kamath-maam (from Mangalore); Sudheer; Damodar (Mangalore); Dayanand (Mangalore); Subash Pai; Guruduth Kamayh; Rohit pai and Shobha. This time, our YHI members group was so big. It felt just like a big strong YHI-basket, intricately woven with the positive strands of the colourful motivating principals of YHI forum. This YHI-Basket was filled with a variety of different colours of beautiful flowers. There were flowers from all the different age groups. There were (8 to 10 age) buds like Suhas’s daughter & niece, then (18 to 25 age) youthful flowers like Studio Raghu and his group, then there were (25-35 age) “Rajnee-Ghandas” type of flowers those who are married couple, who are blooming and blossoming with cozy romance, then there were flowers of “love birds” type, like Mr. and Mrs. Adiga sir. Then there were other few colourful flowers, which are fully grown and are at the thrush-hold of getting over ripe. Then there were few like me, who are only “Cactus flowers” that has no fragrance and are full of pokey thorns. We Cactus flowers, though withered are still tightly holding to the stem of life. The road from Parkala right up to Someshwara was worst. Specially for the guys who were sitting at the last seats of the van, It was so bad that with every violent big jump of the van, it not only shook badly our van but even it shook each and every one’s occupants whole existence. Not only our bodies cried with aches and pains, but even our whole skeleton got dislodged. The journey up to Someshwara was awfully terrible and a real nightmare. 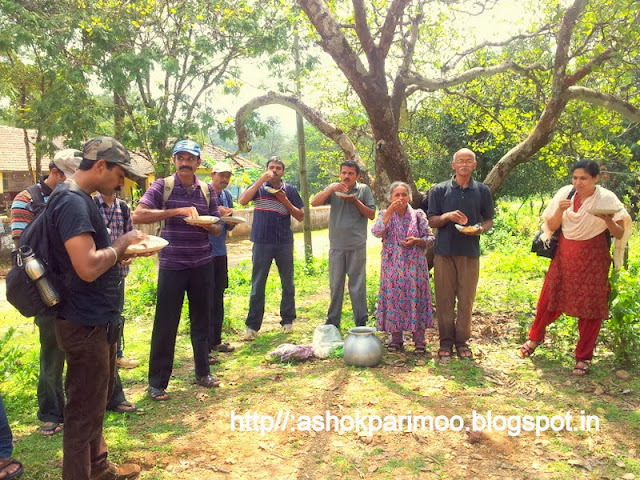 To have breakfast, we stopped at Someshwere village which is at the bottom of Agumbe hill. Since, we were 30 of us, we thought that if all of us enter in to one restaurant, it would take longer to serve to all of us, that would cause further delay to travel for our onward journey. So, we decided to go in to different groups, to different restaurants and have breakfast. At Someshwara though there are three to four restaurants, but all of them belong to one family tree only. Each one of us was served whatever he or she wanted. The only choice was out of hot-hot Neer Dosas; Sweet Buns; Poori Baji; Plain Dosa; hot tea and hot coffee. In addition few of us even packed Parothas and curry for the lunch. After refreshing ourselves at Someshawara, we drove straight via Agumbe to Kigga. Just to avoid the crowded Sringeri temple town, we took a short cut through interior village mud road, which directly reaches us at a cross junction, where one road goes straight to Kudremukh and another one which turns to right, leads straight to Kigga. In our van, there was one Mr. Kamath-maam, from Mangalore, who all along our up and down journey, kept all of us entertained with his hilarious jokes. All his jokes were fun, full of laughter and full of double meaning. In his company we didn't realize the time taken for the journey. Thanks Mr. Kamath-maam, your company is full of fun. Few other members also tried to crack jokes. But all of them looked like a small school boy jokes in front of Kamath-maam’s volume of jokes. It’s not the jokes that mattered. It was the way the jokes were narrated and enacted by Kamath-maam, with varying pitch of whispering voices, squeaky sounds and the roaring laughter that too with the appropriate actions that made the jokes more spicy, more laughable and more hilarious. I am sure every single person in our van enjoyed his company. Kamath-Mam you are great fun. At Kigga, near the ancient Shiva temple, we waited for few more YHI members, who had come to Sringeri directly from Bangalore. After a little while nearly half a dozen youngsters came by auto-rickshaw from Sringere and joined us. From Kigga (for nearly 5 Km) we drove straight first to “Srimane Waterfalls”. To this waterfall the vehicles go right up to the concrete steps, which lead down to the waterfall. So there is no trekking at all. It’s more like a picnic place rather than a trekking. To go to the waterfall we have to buy an entry ticket of Rs. 5/- each. The height of the waterfall may be about 40 feet, but plenty of water cascades down with force. It’s thrilling pleasure to have shower right under the waterfall. I think we spent about 45 minutes there and then moved on to go to another waterfall. YHi’s no trip is complete without the homely hospitality of Mr. & Mrs. Adiga sir’s mouth savoring home made rejuvenating delicacies. Though I have not done to many adventurous trekking with the Adiga couple. But whenever I had gone, it was never ever complete without the love, affection, concern, fondness, warmth and care which were showered on each one of us with their personal genuine attention. Though to reciprocate non us any have done anything other than that all of us respect them just like we respect our own parents. Thank you sweet couple. We boarded our respective vans to go to lesser know “Megebail waterfall”. We had to drive back towards Kigga direction, and after about two Km away from “Srimane Waterfall”, there come a government school, where Adiga sir asked the van driver to stop. As we disembarked the van, Adiga Sir’s, like any famous and renowned magician, from nowhere comes out with couple of metal vessels, paper wrapped packets of eatable stuff and a big packet of the disposal plates. Just like a starved calf who blindly and hurriedly follows after his/her mother cow, same way we all followed Mr. & Mrs. Adiga sir, who rushed under a shady tree with all the magic stuff. With the magic wand of Adiga couple, there comes out a savory mixture of rejuvenating and hunger quenching sprouted grams, black boiled channas, boiled corns, sprinkled with a pinch of salt, pinch of chili powder and pinch of pepper powdered and pinch of other masalas that must be the trade secret of the great couple, who made the whole eating stuff finger licking, tasty, digestive and filling. The stuff was so delicious and tasty that the whole quantity which looked so big, got over very fast. With the tummies filled, every one thanked the Adiga couple. What I have realized is that whatever magic tricks Adiga sir, has learnt so far, can produce only vegetarian stuff. My very special request to Mr. Adiga Sir is that please learn more powerful tricks of magic so that you could produce even some non-vegetarian stuff also. After finishing our eatables, all of us kept the disposable plates in to our own respective bags. No one littered it on the open space. From the school we boarded our vans and took immediate left turn in to a mud road that leads straight towards Megebail waterfall. If I am not mistaken, it may be about 4 to 5 Km distance. Half way through we had to get down from the vans and walk on foot for may be, another two Km. Because there was a huge tree that had fallen across and had blocked the road. Finally we reach the main house which belongs to Mr. Chandershekher and family. It’s a typical old village ancestral huge house, which is surrounded by all the sides, by Araccanut farm , coconut farms and paddy fields. The house looked full of agricultural farming activities, with the owner’s family and the workers family swarming all over. 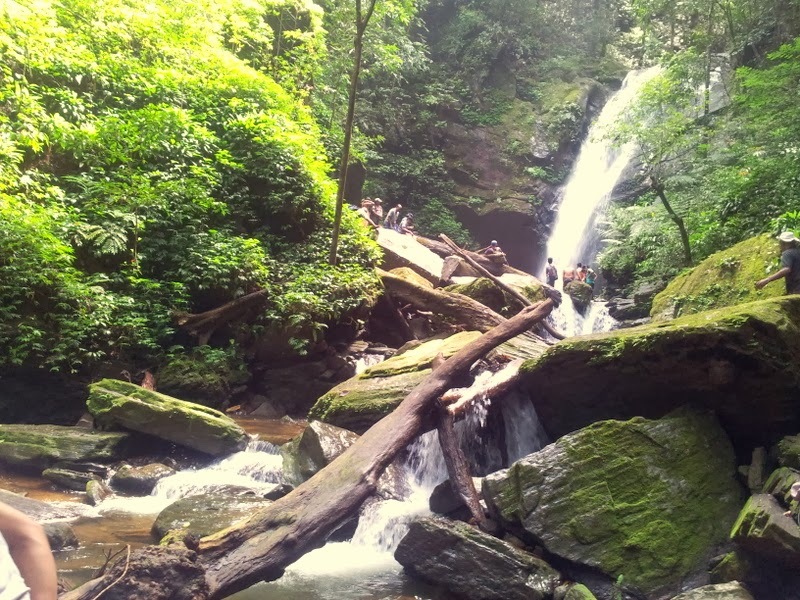 Though Mr. Rajesh Naya and Raganna, knew the route to the waterfall, but it was vague, because it was many many years since they had gone last. So just to avoid the doubt, we requested one of the workers of the estate to guide us, which he willingly did oblige. It was only about 2 Km trek, but there was no proper path, though it was moderately a steep climb but was full of lush green thick bushes, broken trees and tree branches, rotten leaves, wet soil which was infested with hordes of blood thirsty starved leeches. (While coming back, there on the way while walking through the bushes, I unknowingly rubbed my left arm skin against some kind of thick big green leaves. Immediately my whole arms started burning and itching and later it swelled and kept on burning for another two days). At two spots huge trees had fallen and blocked our small bridle path also. All of us to go further had literally to crawl under the broken stem and drag ourselves out on the other side. Almost all of us were attacked by blood thirsty leeches. Leeches from all over came running towards us, as if some powerful magnet was attracting small iron-shavings. Though we tried in vain to avoid from being sucked by leeches, but somehow we failed. At last we reached the final destination of “Megebail waterfall. The distant view of the water fall was amazing and refreshing. On every one’s face, there was a big sigh of relief and a big smile of happiness, of achieving the goal. The cascading of thick and roaring waterfall of aquamarine colour was so refreshing and relaxing. This waterfall has three stage platforms. First one is, as we enter the stream of river, the next platform is the one which is slightly tougher and higher and the third platform is the one which is tougher and higher up to the point from where the waterfall cascades down. The height of the waterfall may be about 80 feet high. Only few of the members climbed up to the last platform, rest of us camped ourselves at second platform itself. Everyone got into action of clicking pictures, bathing under waterfall, relaxing, enjoying, laughing and screaming. 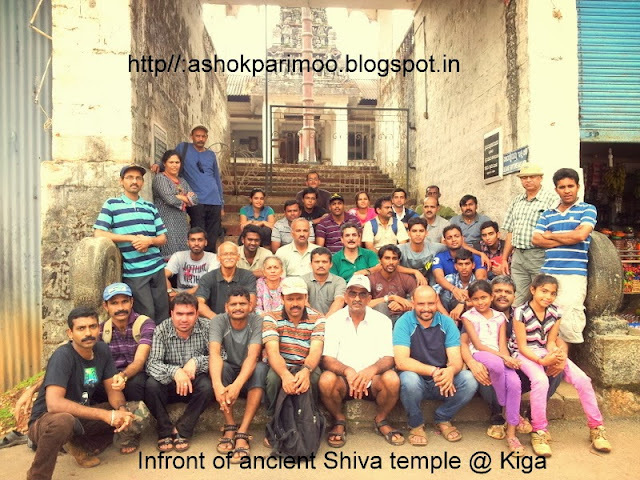 After finishing our lunch and repacking, roundabout at 4 PM, we wound up and came back to Kigga, where we clicked a group photo, sitting in front of the entrance of the Shiva temple. Because, from there the guys who had come from Bangalore had to go back to Sringeri, where as rest of us had to proceed back towards Agumbe via Barkana. Since we were travelling by two separate vans, the van which was in-front of our van most probably didn’t know the exact location where to stop to go to Barkana. They lost the way. So we lost quite some time to catch up with them. By the time we reached the correct spot, it was already about 6 PM and was about to get dark. All of them, except me, Guru and Rajesh Nayak, ventured out in to the forest to reach Bakarna through the muddy, slushy uneven mud road that too was infested with leeches. Anyway it got suddenly so dark, that everyone had to come back without reaching Barkana. From there we drove straight back to Udupi and by the time we reached Udupi, it was almost 9 Pm. In the nutshell, thank God that it was a mishap free, wonderful, refreshing, enjoyable and rejuvenating adventurous day outing. Thanks to everyone and we are looking forward for many more HYI trekking in future too. Thank you for narrative blog. Every minute detail is remembered and well documented. Thank you for good words about everything, everybody and YHAI. Let the youngest mind inspire everyone. Good narration with nice photography......Keep going Parimooooo.......... Veena Deepak. fabulous reading . keep writing. hum mange more.